As a child the present Tai Situpa, formerly head of great monasteries, had to struggle to survive with his few attendants, all suddenly refugees in India. He and his three monks barely scraped by until an American relief organization provided a sponsor for the young lama. Nola McGarry, his American foster mother, contributed to his support while he grew up and also encouraged him to learn English, both in her letters and by sending him books to study. She did not meet him until I980, during his first teaching tour in America. At the age of twenty-two, Situ Rinpoche assumed responsibility for founding his own new monastic seat on some land that had been offered to him by disciples from Dege and Nangchen. With the blessing and encouragement of the Karmapa, he left Sikkim for Himachal Pradesh, a Himalayan state in Northern India. There he had tents set up on some forested land in the hills near Palampur, close to the Tibetan community of Bir, and began construction of Sherab Ling Monastery. For five years the monastery grew slowly. Along with the monks came a small group of Western students, some of whom sponsored the construction of retreat houses on the land, where people could engage in serious meditation practice under the Tai Situpa's direction. He made his first visit to the West in I981, when he taught at Samye Ling Tibetan Centre, Scotland. He returned for his first teaching tour of America in I982, having been there in November of I98I at the time of the passing of the sixteenth Karmapa, near Chicago. He also toured Southeast Asia. Since that time his activities have been divided between international teaching tours and his own quiet monastery in the hills of Himachal Pradesh. Besides his role as a Buddhist monk, teacher, and abbot, Situ Rinpoche is a particular commitment to world peace, which resulted in I989 in his Pilgrimage for Active Peace, involving religious leaders and humanitarians around the world in the effort to evolve practical means by which individuals can actively contribute to developing inner and outer peace for themselves and others. His concern to share the principles of Buddhism with others led him in I983 to found Maitreya Institute, a forum where different approaches to spiritual development can be explored and shared through the arts as well as through philosophy, psychology, art healing, without sectarian or religious bias. In the early 1990s, the Tai Situpa discovered that an amulet given to him by the 16th Karmapa contained the letter revealing his new incarnation. 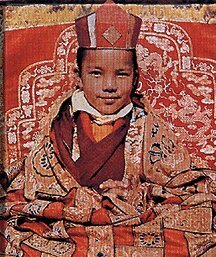 The Situpa ensured that the new Karmapa was properly found and he, along with the Goshri Gyaltsabpa, went to Tibet in 1994 to give first precepts to the new Karmapa and enthrone him at his traditional seat of Tsurpu. The Tibetan namthar, or biography of an incarnate lama, contains the history of the subject's lineage of incarnations, because the current incarnation is seen as the same enlightened entity, though he is inhabiting a different body. The Tai Situpa is twelfth in a line of incarnations that spans over a thousand years and whose history is integral to the religious and scholastic development in Eastern Tibet, particularly Kham, where his large monastic seat, Palpung, is located.